Contrary to popular belief, marsupial herbivores' increased face length is not linked to an increase in body size, Research by PhD student Rex Mitchell has found. The length of the face increases with an increase in body size in several groups of mammals, including in fruit bats, mongooses, antelopes, tree-squirrels and cats. This trend between body size and face length has been proposed as a potential biological rule that holds true across all mammals with few exceptions. But the length of the face is also known to be influenced by how hard an animal bites — shorter muzzles have been noted in species that bite harder onto more resistant foods, including in pandas, Tasmanian devils, and the extinct ‘nutcracker man’ (Paranthropus boisei). A team of researchers, led by PhD candidate Rex Mitchell of the University of New England, have put these two competing hypotheses to the test in a comprehensive examination on herbivore skulls. 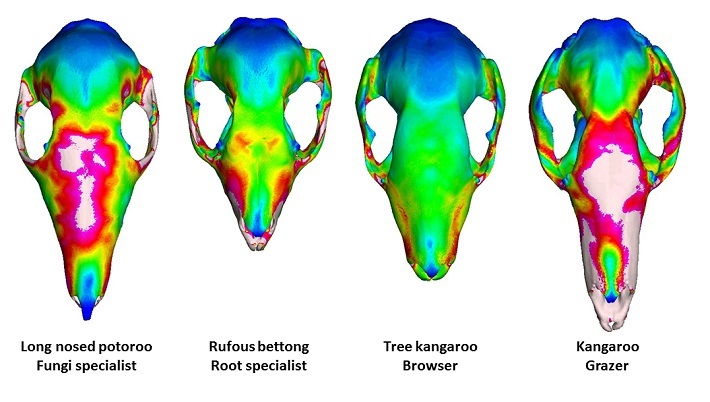 Using a combination of 3D shape analysis and advanced digital modelling, the influence of body size and diet on the shape of the cranium was tested across 16 species of kangaroos and their relatives. Being a herbivore means being spoiled for choice, with plenty of accessible different plant parts and tissues to choose from. Smaller herbivores tend to focus on high energy foods, such as fruits, fungi, roots and tubers. Larger species, on the other hand, must include large amounts of lower quality vegetation to meet their nutritional demands. This includes the leaves and stems of plants, broadly separated into two groups: graze (the leaves and stems of grasses) and browse (the leaves, stems and branches of trees and shrubs). These dietary habits also hold true for kangaroos and their relatives. Macropodiformes is a group of marsupial herbivores native to Australia and New Guinea that includes over 70 species of kangaroos, wallabies, bettongs, potoroos and rat-kangaroos. Mitchell and his colleagues examined the skulls of over 200 kangaroos from a range of environments, spanning their entire size range, from the musky rat-kangaroo (less than 1kg) to the red kangaroo (over 85kg). The skulls were sampled for 3D comparisons of shape. 3D biomechanical models of each species were then created from CT (serial x-rays) and subjected to computer-simulated biting to compare how well each species can handle a hard bite at the front teeth. The researchers found that the length of the face is not associated with body size, with similarly long muzzles found in species across the entire size range. Instead, they found that the length of the face is associated with the hardness of preferred foods and biting behaviours used to access them. Among the smaller species that seek out energetically rich foods, those that specialise on soft foods, such as fruit and fungi have a longer face, while specialists of more resistant roots and tubers have shorter faces. Among larger species, browsers of trees and shrubs have a shorter face, while the face tends to be longer in grazers. The team believe the consistent and predictive nature of these findings may be of use when planning conservation and management strategies for vulnerable or endangered species, as well as for extrapolating the potential diets of extinct kangaroos from prehistoric environments. The research is published in Proceedings B of the Royal Society of London as The biomechanics of foraging determines face length among kangaroos and their relatives.